Fireworks are different colors because they burn at different temperatures. I make fireworks as a hobby. This is why it is easier for purple stars to get blown dark than red ones. The burst charge may not be hot enough for long enough to light them. That is just flat wrong. Fireworks are different colours because the different metal salts in them produce light of different wavelengths depending on their respective electron energy levels. Not particularly. The Earth and the atmosphere at the surface are the same temperature. They are both emitting the same thing. The Earth is emitting a much narrower spectrum and at lower power than what comes from the sun. Absorption has more to do with the sun, simply because more energy is available from that direction. Absorption is directionless, but the greater energy source is prevalent. Well, that can't be right. On average, the Earth must be emitting the same amount of energy as it receives from the sun if it is to maintain a constant temperature. It's just that most of the energy from the sun comes in the form of visible light, while the radiation emitted from the Earth is all infra-red. This means there is more IR radiation going up than going down. As we know, the atmosphere is completely transparent to visible light, but it is not completely transparent to IR radiation. Some of the IR radiation passing through the atmosphere (most of which is going up, remember) is absorbed and subsequently re-emitted in all directions. So some of it goes back down to the ground again. Both techniques are used. It is not flat wrong. Light comes from two methods, not just one. Remember our discussion about LEDs and florescent tubes? False equivalence. Energy is energy. You are assuming the surface is the only thing with absorption and the atmosphere is not in one direction, then assuming the atmosphere is absorbing energy in the other (outward) direction, as if the Earth is the sole source of that energy. Absorption has more to do with incoming energy than anything outward, simply because that's where the source of energy is coming from (the sun). The amount emitted by the same Earth atmosphere unit is the same as what is incoming. Remember the incoming energy arrives in pulses, while the outgoing energy is continuous. The atmosphere does not increase the mean temperature. It moderates it. 'Greenhouse' gases do not increase the mean temperature either. They only moderate it better than other gases. No. The form in which the energy comes makes a big difference to its interaction with matter. An 800W X-ray emitter will have very different effects on nearby materials than, say, an 800W microwave emitter. 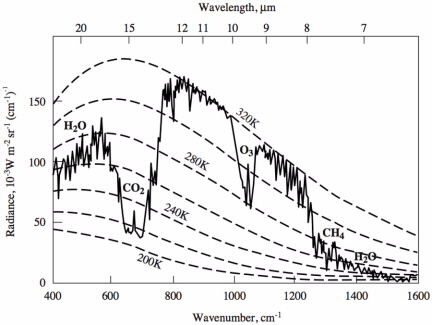 We know that greenhouse gases, such as CO2, are transparent to visible radiation but strongly absorb IR radiation. This is why CO2 has comparatively little effect on incoming (mostly visible) sunlight but is very effective at absorbing and re-emitting outgoing (IR) radiation from the Earth. It is this asymmetry that is responsible for its warming effect. No. The form in which the energy comes makes a big difference to its interaction with matter. You're playing semantics games. No, it does not matter the frequency of the electromagnetic energy that is absorbed. The 1st LoT expresses clearly that energy is energy. All absorbed energy will become thermal energy and will affect temperature (or state) which will then determine thermal radiation (Planck's Law). 1 joule of IR absorbed becomes 1 joule of thermal energy, just as does 1 joule of ultraviolet, 1 joule of HF, or 1 joule of green. I notice you still haven't gone on the record as officially declaring that, as far as you understand science, Planck's law does not apply to the earth. Why not? You have been implying as much as your way of defending your version of "greenhouse effect." State it, or accept that it applies and acknowledge that your version of "greenhouse effect" violates Planck's law. You are ignoring the incoming energy from the sun, most of which is infrared (slightly over 50%), and you are ignoring intensity of radiation completely (by the Earth, the sun, or anything else). You are also ignoring the effect on other gases the CO2 is floating within. They heat and cool it too, you know. Considering the tiny amount of CO2 in the atmosphere, most of the heating or cooling of CO2 is by conduction and convection, not by direct radiation. As far as the form, no. 800 watts is 800 watts. That is 800 watts of energy put into nearby materials. If one material heats up by A and conducts that heat to B, or if B heats up and conducts that to A, it makes no difference. You cannot isolate gases this way. You must consider them as an aggregate. I'm not ignoring any energy from the sun. The sun's radiation is primarily in the UV, visible and near-IR part of the spectrum. CO2 is almost completely transparent to this part of the spectrum. And I'm not ignoring intensity. The first LoT dictates he average intensity of radiation received by the earth must equal the average emitted for the Earth's temperature to remain constant. This is irrelevant. Yes, CO2 exchanges thermal energy with other gases, but this has no effect on its ability to absorb and re-emit far-IR radiation. You're being deliberately obtuse here. The point is that the form of the radiant energy dictates the extent to which it interacts with different substances. Energy in the form of visible light, for example, barely interacts with CO2 at all. Energy in the form of far-IR radiation, such as that emitted by the Earth, is strongly absorbed and re-emitted by CO2. You can clearly see how the spectrum deviates from that of an ideal blackbody as a result of absorption by the various greenhouse gases in the Earth's atmosphere. This, as I wrote earlier, is analogous to the Fraunhofer absorption lines seen in the sun's spectrum. Surface Detail wrote: Yes, CO2 exchanges thermal energy with other gases, but this has no effect on its ability to absorb and re-emit far-IR radiation. Irrelevant. CO2's particular absorption signature does not endow it with any magical superpowers to violate the LoT or Planck's law. Surface Detail wrote: You're being deliberately obtuse here. The point is that the form of the radiant energy dictates the extent to which it interacts with different substances. Irrelevant. All substances have differing absorption signatures. All solar energy that strikes the earth and that is not reflected/deflected away is absorbed. All that matters, as you have previously mentioned, is the quantity of energy being absorbed. This exact quantity of energy is being emitted by the earth in the form of thermal radiation, just not in the same form in which it was absorbed. There is no need to get bogged down in the endless quantity of instances that energy changes form, and exactly how, from terrestrial absorption of solar radiation to terrestrial thermal radiation. Just stay focused on the big picture. Oh, I'll presume that you acknowledge Planck's law applies to earth and that you realize your version of "greenhouse effect" is fiction...just like the rest of them. Notches in radiated energy make no difference. What is not radiated directly (such as CO2) is radiated indirectly (by passing it's energy to another substance that does). You are trying to count individual molecules here and trying to figure out which one is losing energy faster. You don't have to. The aggregate is fine. It is not being obtuse to say 800 watts is 800 watts. You, on the other hand ARE attempting a false equivalence. To say that THIS 800 watts is different than THAT 800 watts is ridiculous. To make that claim would violate the 1st law of thermodynamics. It would also violate Planck's law. (1285) Light of different wavelengths interacts differently with things. If you take a piece of glass and put it between you and a fire the radient heat from that fire will no longer get to you. It will allow the visable light through but stop tmost of the IR. Take the glass away and feel the heat. The sun's energy has IR in it, and all the rest. The IR bit is mostly absorbed by stuff in the air before it gets to the rocky surface. The higher frequency stuff gets down here. And heats us up. The radient energy given out by the surface is almost all IR. This is because it's not that hot. The air absorbs some of this IR, some gets out. If the degree of absorbsion is increased it will tend to make the surface down here warmer. That is untill the amount of warming is enough that more IR is produced and thus more makes it out. I do not know enough to say anything about the detail beyond that or the degree to which CO2 is effective in doing this. I think, but with no significant confidence in my ability to understand it well, that it is likely that almost all the effect of increased CO2 is already done by water vapor in all but the driest conditions. But that's just my spectators view. Even if CO2 is 100% effective as claimed it is of minor consequence. It will not warm the planet significantly in an economic sense. There will be no drastic problems at all. About 1.5c by 2100 maybe. The warmist/alarmist side claims that this warming will have the effect of creating more warming. That it will increase water vapor which will cause more heating which will..... Thus a 4.2c warming by 2100 is projected. The data since these projections were made is that it has not warmed at all. It also has not cooled. In fact the last 18 years have been strangely stable. Personally I see no trouble with a 4.2 degree warming, bring it on, but with the data since the projections were made I think it is surely right to discount the top half of the uncertainty range and look at a maximum of 2 degrees c warming by 2100. Tim the plumber wrote:Light of different wavelengths interacts differently with things. Very good. Every substance has its own unique EM absorption signature, along with its own unique EM reflection signature. All EM energy that is absorbed, regardless of frequency, is converted to thermal energy. All EM energy that is reflected, regardless of frequency, ceases to be a factor. What are you saying is being claimed of CO2 when you write "Even if CO2 is 100% effective"? Effective at what? Tim the plumber wrote:About 1.5c by 2100 maybe. Why do you believe this? Do you have any science that links CO2 to magical heat-generating superpowers? Tim the plumber wrote: The warmist/alarmist side claims that this warming will have the effect of creating more warming. This is rich. You, of all people, are trying to find fault with one particular part of the dogma of a competing denomination of your religion (i.e. the "alarmists")...like they are heretics for claiming the evil "greenhouse gases" will cause 4.2degC of warming instead of the 1.5degC of warming that you know to be true!. Your belief is just as absurd as that of the warmizombies, and just as scientifically unenlightened, and you still wonder why I point out the WACKINESS of your religion. You are only in it for the feeling of divine knowledge that you get from practicing your climate lemming faith. Tim the plumber wrote: The data since these projections were made is that it has not warmed at all. It also has not cooled. Someone who is trying to be honest would acknowledge "We don't know if the earth is warming or cooling right now but whatever the case, any change is too negligible for us to notice." Your religion, however, requires you to profess that you know that "greenhouse gases" cause an "increase in temperature" and to ignore any science that runs counter to that "knowledge." Who do you believe has the magic superpower to "bring it on"? Why do you ask for "data" as opposed to asking for the science that says this will happen? Have you officially gone into "evade science" mode? Supporting "evidence" has no role in science. Tim the plumber wrote:I do not know enough to say anything about the detail beyond that or the degree to which CO2 is effective in doing this. I think, but with no significant confidence in my ability to understand it well, that it is likely that almost all the effect of increased CO2 is already done by water vapor in all but the driest conditions. But that's just my spectators view. You wear your avoidance of science like a badge of honor. Is there any particular reason? [color=blue]Light of different wavelengths interacts differently with things. Agreed - that's pretty much the way I understand it. I do not know enough to say anything about the detail beyond that or the degree to which CO2 is effective in doing this. There's nothing wrong with acknowledging the limit of one's understanding. I certainly wouldn't pretend to have a particularly deep understanding of the topic either. As Bertrand Russell said: "The trouble with the world is that the stupid are cocksure and the intelligent are full of doubt." As I see it, the more you learn, the more you realise that there is to learn. I think, but with no significant confidence in my ability to understand it well, that it is likely that almost all the effect of increased CO2 is already done by water vapor in all but the driest conditions. But that's just my spectators view. Although water vapour is indeed the main greenhouse gas, it differs from CO2 in that its concentration in the atmosphere depends on the temperature. If you were to pump a billion tons of water vapour into the atmosphere, it'd be gone again (as rain) in a day or two. With CO2, this is not the case - it takes thousands of years for geological processes to re-absorb it. What this means is that CO2 effectively amplifies the effect of the non-condensing greenhouse gases. That's your opinion. Those who have done the sums think otherwise. ...side claims that this warming will have the effect of creating more warming. That it will increase water vapor which will cause more heating which will..... Thus a 4.2c warming by 2100 is projected. 4.2 C about is the highest prediction, I think. And it assumes business as usual. The last time the world was anywhere near 4.2 degrees warmer (the Eemian interglacial, about 3 degrees), we had hippopotamuses in the Thames and the sea level was about 5 metres high then today. Personally, I've no great love for London and New York, but YMMV. Surface Detail wrote: There's nothing wrong with acknowledging the limit of one's understanding. Absolutely correct. There is, however, something very wrong with admitting to having a limited understanding but then attacking those who are trying to explain it to you, just because the explanation does not align with your religious views. Surface Detail wrote:I certainly wouldn't pretend to have a particularly deep understanding of the topic either. ...but you will nonetheless allow your religious sensitivities to become incensed at any scientific explanation that blows a gaping hole in your theology. Surface Detail wrote: As Bertrand Russell said: "The trouble with the world is that the stupid are cocksure and the intelligent are full of doubt." ...and Global Warming is the preferred religion of the stupid, cocksure, scientifically illiterate. Would I be correct in presuming that a "greenhouse gas" is simply a gas whose absorption signature includes some portion of the very broad IR band? If so, remind me how this causes an increase in temperature without violating the laws of physics...according to your understanding of course. Surface Detail wrote: it differs from CO2 in that its concentration in the atmosphere depends on the temperature. How does this difference pertain in any way to how it causes an increase in temperature without violating the laws of physics, and how it will clearly lead to a 4degC increase in temperature as opposed to only a 1.5degC increase as he claims? How does any of this relate to any of this? Surface Detail wrote: Those who have done the sums think otherwise. Once again you are making a lame appeal to unnamed, invisible and non-present "authorities" because you've got nothing in the way of support for your claims. No one can check the work of those nonexistent people "who have done the sums" now can we? They aren't here for us to cross-examine, are they? There aren't any people who have "done the sums" because there aren't any people who have any formulae to perform such calculations because there isn't any "greenhouse effect" science because "greenhouse effect" is an unfalsifiable religious dogma that completely violates the laws of physics. The term you're looking for is "political activist". In some cases the term "Marxist" applies. Surface Detail wrote: 4.2 C about is the highest prediction, I think. And it assumes business as usual. Suppose it's not "business as usual." Suppose 10% of the atmospheric nitrogen were instantly substituted for an equivalent mass of CO2. Once everything were to settle, what would happen to the overall average planetary atmospheric temperature and what would happen to the overall planetary thermal radiation? (According to your understanding of physics of course). Let's walk through this again because you don't seem to "get it." All you had to say was that you haven't the vaguest idea what constitutes a valid dataset. (1) Sharing this piece all the way from the Philippines, one of the most vulnerable victims of climate change and how #COP21 affected us. Sharing this piece all the way from the Philippines, one of the most vulnerable victims of climate change and how #COP21 affected us. In what way is the Philippines "vulnerable?" Where do you imagine the water would come from to reproduce that? The ice sheets of Antarctica and Greenland are thicker now than then. And would not be significantly affected by such a temperature rise. Antarctica and Greenland would, as in the Eemian interglacial, be significantly affected by such a temperature rise. However, we're talking about final equilibrium values here, which would only be reached in a few hundred years. It takes a while for that much ice to melt! Antarctica is generally (other than the Peninsular) at it's warmest on a summer's day at -20c. If it warms by 4.2c then it will still never melt. The fuss that it has lost a bit of ice here and there is where large chunks have been blow away to warmer places and then melted. This is due to the wind's changing about from time to time. Only the floating stuff is capable of doing this. Some tiny amounts of ice have melted as well as a result of volcanoc action. The bulk of Greenland's ice is similarly safe. The bits around the edge are vulnerable to a bit of melting here and there but the central mass is not. At least not untill a 15c or more rise has happened. Remember that the 4.2 C is a global average temperature; warming in the Arctic and Antarctic is expected to be about twice that value, whereas warming near the equator is expected to be less pronounced. This would result in considerable ice melt across Western Antarctica (where your summer maximum of -20 C is not correct), which would lead to a rise in sea level comparable to that determined for the Eemian interglacial. I found 1 station in Antarctica. -3 is the warmest for this coastal location. That is comparible to some of the coldest places in Greenland. I will not be expecting any serrious melting there. Regardless of what you are expecting, we have strong evidence that during the Eemian, when the global average temperature peaked at about 3 C above the modern pre-industrial global temperature, the oceans rose to a level about 5 metres higher than today. This water must have come from somewhere. It's thought that most of it came from Greenland, but some is likely to have come from Antarctica. This isn't based on models; it's based on geological evidence, and today's human-induced temperature rise will very likely result in a sea level rise similar to that of the Eemian. Regardless of what you are expecting, we have strong evidence that during the Eemian, when the global average temperature peaked at about 3 C above the modern pre-industrial global temperature, the oceans rose to a level about 5 metres higher than today. Aaah, that "supporting evidence" again. Christians have strong evidence that Jesus rose from the dead. Surface Detail wrote: This water must have come from somewhere. *or* it never rose to five meters above its current level.